What makes regular science fiction even better? When it's set in the near future and features flying cars. Well, okay, there are a lot of factors that make sci-fi so much fun for so many of us, I gotta admit, I'm a huge fan of flying cars. 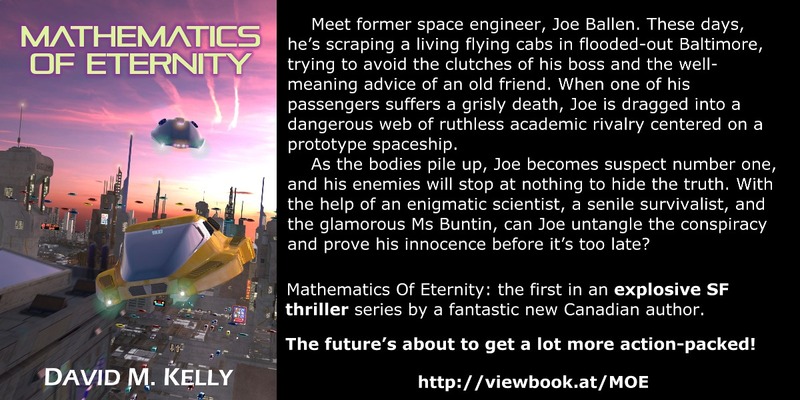 So when I saw the cover for David M. Kelly's latest book, Mathematics of Eternity, which as you can see, features a flying taxicab, I got super excited. That's right, Uber, cabs are still a thing in the future. Impressive, eh? Both the cover and the trailer were created by the author. I don't know about you, but I'm super jealous. In celebration of the release of this, David's first full length novel, I've asked him to tell us a little more about his writing, being an indie author, and which of his worlds he'd want to be trapped in. So here we go! 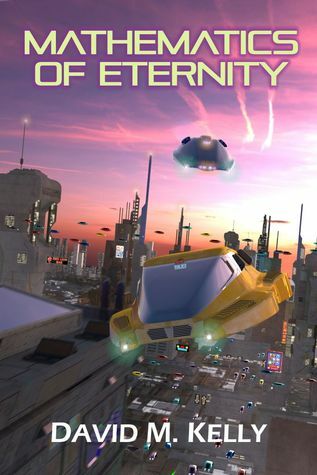 Christina McMullen: You’re latest book, and first full length novel, Mathematics of Eternity, takes place in the semi-near future and paints an almost too realistic portrait of planet-wide ruin. Tell us what it’s about and what inspired you to write this particular story. David M. Kelly: The novel is a fast-paced, action thriller set in Baltimore a hundred and thirty years from now. My lead character, Joe Ballen, drives flying taxis. When one of his passengers dies in gruesome fashion at the beginning of the story, he becomes a murder suspect and is dragged into a conspiracy involving a prototype spaceship and several dead scientists. With help from a diverse set of characters, including his glamorous boss and a senile survivalist, Joe has to unravel the mystery and prove his innocence. I wanted to create a picture of a world that allowed for certain developments such as the development of orbital space-based populations, but wanted to keep the story grounded close enough to the present as to still be very recognizable to people now. I think that the lack of political will around the world on tackling climate change will cause a lot of problems. That lends itself to a dark and somewhat bleak setting, but I also wanted to put forward the idea that people haven’t given up and are still trying to deal with these things and improve their situation. So you have a world that’s in some ways quite desperate, but also with an underlying sense of optimism that humanity can deal with the issues if it chooses to. CM: Previously, you’ve written quite a few short stories and novelettes. Which is your favorite and why? CM: Certain characters from your shorts pop up as Easter Eggs in this novel. Is this just for fun or is this an in-universe connection? Will we see more bridges to past books in future installments of this series? DM: When I first started reading science fiction I was fascinated by Robert Heinlein’s idea of “Future History” where he wrote a series of short-stories and later novels that had a loosely connected timeline. When I started my own writing projects I thought it would be a fun thing to do for me as a writer but also (hopefully!) for the reader. I try to keep it subtle and the connections are always a little tangential, so it’s not vital to have read everything I’ve done before, but I think it adds a little extra layer of “historical” detail that makes the world setting richer and sometimes gives characters and situations a life beyond the initial scope of the story they appeared in. CM: It’s the broken question! Alien robots have destroyed reality as we know it. You have been collected and unceremoniously dumped into the world of your own creation (itchy underpants optional). Which of your stories do you hide out in and which of your characters, up to three, do you choose to keep you company/fight for the users? CM: What is the best part about being an indie author? DM: The best part of being an indie author is the freedom to write what I’m inspired to write, but closely followed by the indie community itself. There are so many talented and supportive people out there who are willing to help you when you have a problem, provide emotional support, or give you a kick when needed. So it’s a wonderful time to be an author and an indie. Mathematics of Eternity is available now! Awesome interview! And that trailer? Holy crap! !